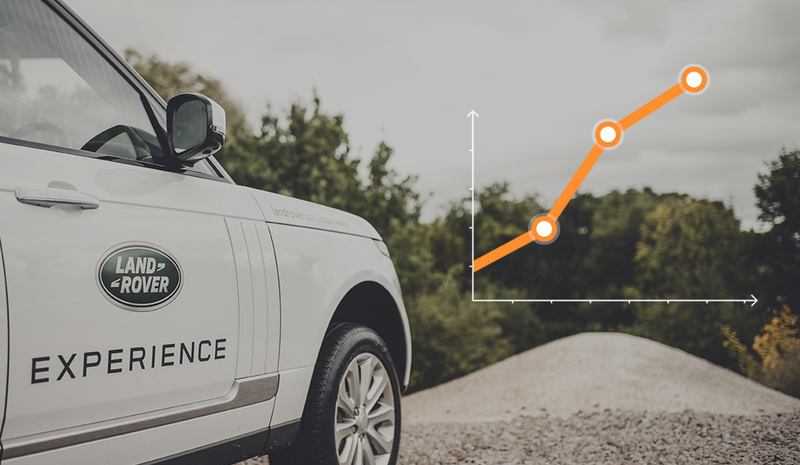 How did Jaguar Land Rover Experience achieve the following fantastic metrics in just three months? Through highly targeted, strategic digital marketing, driven by the team at Cognition, and delivered through HubSpot – that’s how. “I just wanted to drop you a note to say thank you for the very professional and effective marketing support that Cognition are providing to the teams. It seems to be really kicking in now and helping to drive the growth in the business. Jaguar Land Rover Experience (JLRE) is the experience day and corporate event arm of the Jaguar Land Rover Group. Cognition manages all marketing activity for four of JLRE’s experience centres across the UK – Castle Bromwich, Eastnor, Solihull and Liverpool. The venues offer off road driving experiences, team-building days, corporate hospitality events, factory tours and state-of-the-art conferencing facilities for businesses. While Jaguar Land Rover is a household name, its experience arm operates almost like an SME – and therefore requires a completely different marketing strategy to that of its retail function. JLRE wanted to appoint a new agency that understood how best to target retail and corporate audiences with tailored messaging about experience drives, manufacturing tours and its overall corporate offering. JLRE also felt that sales did not reflect previous investment – it wanted marketing that both reduced overall spend and wastage, while increasing leads and sales. In addition, JLRE was looking for transparent, thorough reporting across all channels in a joined up way, to ensure that the budget was being spent in the right way and in the right places to deliver its business goals. Historically, JLRE’s Christmas campaigns were implemented on an ad hoc basis, with each venue managing its own spend and strategy. There was no single message, drive or call to action and spend was largely with local print media – which couldn’t be tracked, reported or measured against. This was not only impacting JLRE’s uniformity and consistency of messaging (something the more corporate, retail arm of the business demands) but it was ultimately having a detrimental affect on bottom line - as sales were not coming in. JLRE appointed Cognition following a four-way pitch. On completion, Nicola Tierney, JLRE communications manager, said: “Cognition really impressed us with their multi-channel approach and their in-depth knowledge across all areas. The first challenge was to increase sales at Christmas. To make the biggest possible impact, Cognition embarked upon a multi-channel approach across the four venues, using HubSpot to attract, inform and convert. While JLRE has a multitude of buyer personas, the “gifter” market was the focus for the Christmas campaign and as such, all activity pointed towards the purchase of a voucher. We created a Jaguar branded email and sent it to a segmented list of previous Jaguar guests, and a Land Rover branded email for previous Land Rover guests from Solihull, Eastnor and Liverpool. Our aim was to raise awareness of the gift vouchers to people who had previously been on one of the experiences – they were our immediate audience, and the obvious place to start. Using HubSpot lists, we were able to segment by past trends and audience behaviour to ensure a highly targeted and intelligent approach. HubSpot allowed us to monitor engagement and track the customer journey. We used this insight to create highly targeted workflows that engaged with prospects, wherever they were positioned in the buyer's journey. The next stage was to reach out to a potential new audience through paid social (Facebook) campaigning. We focused heavily on the “gifter” audience and ran two months’ worth of testing (earlier in the year) experimenting with different targeting options to refine the ideal audiences – namely, those who had the most engagement with the JLRE brands. Using social media custom monitoring streams we were able to monitor HubSpot lists filtered by keywords and questions. This gave us the opportunity to listen and interact with any potential leads, unknown audiences, and influencers. Lookalike audiences based on website visitors. Engaged shoppers, namely people who are actively looking to purchase. Parents with adult children; married or recently married. We increased the budget upon existing campaigns, because people were likely to be searching for the generic keywords we already had. In addition, we created further targeting to include broader experience / driving enthusiast experience gift keywords. We delivered a custom intent campaign, targeting people who search for or visit websites related to experience days and gifts, such as Not on the High Street, Red Letter Days, Virgin Experience Days and I Want One of Those. Historically, all venues have run local marketing campaigns. For the 2018 Christmas campaign, we wanted to focus on testing whether this would deliver return and following the positive results we will be doing local marketing for all venues in future. We partnered with “Visit Liverpool” as it is the main destination marketing company within the Liverpool area, and the “go to” site for people looking for a day out in the area. It has also been a key partner for Land Rover Experience Liverpool for many years. Our main focus was on advertising both on the website and through the email newsletter. We also ran a print advert in Liverpool Loves Christmas, and collaborated with the team at Liverpool Loves on a series of targeted boosted social media posts, where we created content aimed at various audiences; the Liverpool Loves Facebook audience, friends of friends of the audience and "similar audience" to audience who already like the page. 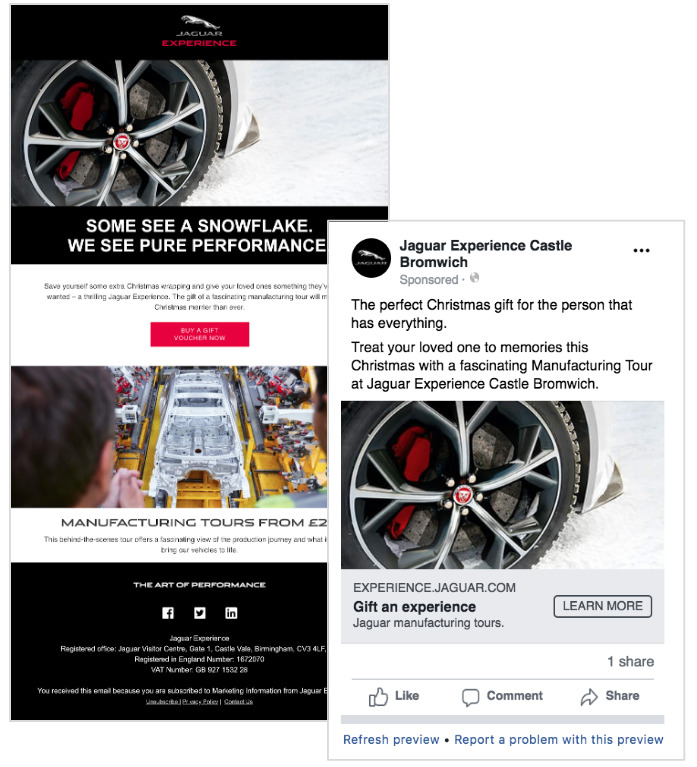 We ran an initial campaign in November, boosting posts to each audience in order to understand which provided the most positive engagement and then launched additional adverts in December to those audiences. We partnered with Visit Cheltenham, a local destination marketing company and advertised on its website, and also with lifestyle magazine SoGlos, where we used social media, sponsorship and a Christmas giveaway. 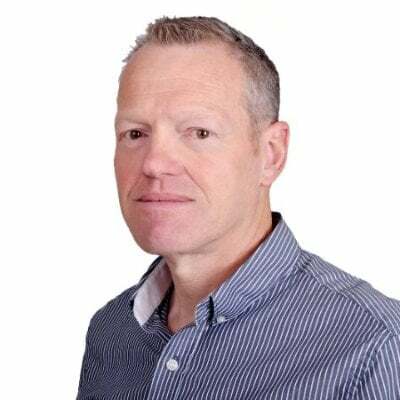 As Cognition's Managing Director, Tim sets by example by being an incredibly driven and commercial businessman who has built a very impressive marketing consultancy which has continued to grow year on year. With a very straight and honest approach to business, he ensures he gets the best results for his clients and builds strong partnerships with his suppliers.